Here we are aboard Ursa Major—a 65-foot North Sea trawler rolling softly in gentle Pacific swells a mile off Lituya Bay on Alaska&apos;s south central coast. The plan is to cross the bar-known for doling out death and destruction—and enter a harbor whose own horrifying history includes even more death and destruction in a setting of incredible natural beauty, without becoming part of Lituya Bay&apos;s grisly record. The commanding officer, Jean-Francoise de Galaup, comte de LaPerouse, had dispatched two small boats and 21 sailors to survey the bar at the bay&apos;s entrance. Moving easily, the rowing boats turned a point on Cenotaph and disappeared. LaPerouse could not see the two small boats as they approached the harbor entry and was unaware the craft had been overpowered by a swift ebb current. He would have been horrified to watch as the rowing boats, despite the efforts of skilled and powerful sailors, were carried over the bar and overturned by breaking ocean swells, the 21 seamen swallowed by the sea. Over the years, other vessels have been tossed about, rolled over, and sunk and their crews killed in untimely crossings of the bar. Legend hints that Indian canoes, probably returning to camps after fishing in the sea or trading along the coast, met the same fate. The worst recorded natural disaster came the evening of July 9, 1958, as three small commercial fishing boats anchored in Lituya Bay after a day of fishing in the Pacific Ocean. Probably alerted by the noise, crew members turned and watched as the rock and ice walls at the head of the bay collapsed into the water and an enormous wave (scientists call this a gravity wave) surged toward them at a speed calculated at more than 100 miles an hour. The slide and wave had been triggered by a jarring earthquake with a magnitude of about 8. As Ursa Major moves closer to shore, skirting shoaling areas, I wonder how LaPerouse, probably the first European to enter Lituya Bay, found it in 1778. From a few miles off shore, the opening can be lost in the coastal blur. We have Nobeltec and NOAA charts, so finding the bay was easy. Those 18th-century sailors were barely able to calculate longitude and were working with charts that were sketchy at best. 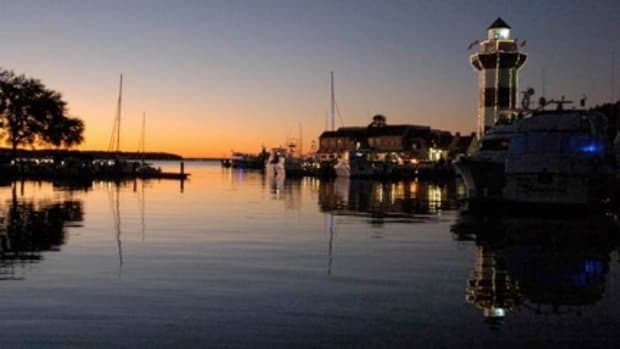 I admire LaPerouse&apos;s sailing skills in conning two square-rigged vessels safely across the bar, although some reports indicate he was carried in by a flood tide. Reaching Lituya Bay can be rigorous. The small harbor (about 7 miles long) is in a seldom visited and almost out-of-reach northwest section of Glacier Bay National Park. 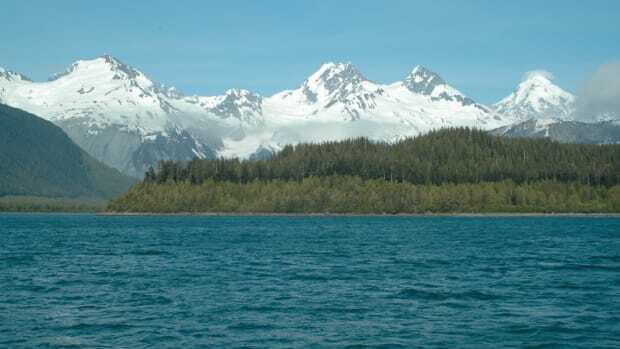 It is about 140 sea miles northwest of Juneau and 125 miles due north of . The route requires crossing about 40 miles of open ocean. Cape Spencer is the turning point, the landmark that separates inland waters from the ocean. 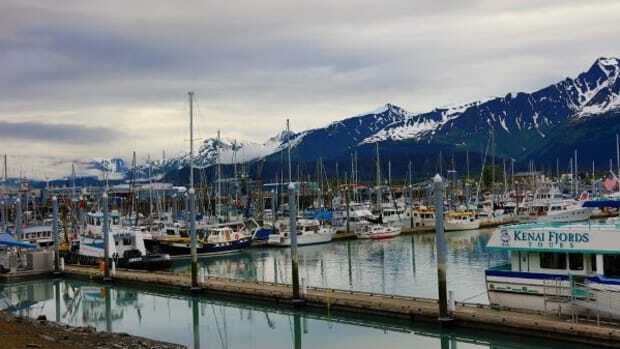 Coming from either Juneau or Sitka, there are several anchorages and landings that would be good places to stop for the night before venturing out onto the ocean. LaPerouse had taken his two ships; L&apos;Astrolabe and La Boussole, through the dangerous entry on June 30, 1786. Centuries later, we followed and Cami Cash, Joyce&apos;s sister and first mate/chef, dropped Ursa&apos;s huge anchor in a bight on the east side of Cenotaph Island as, apparently, had LaPerouse. With the anchor down, the aluminum skiff was launched and shrimp and crab traps deployed. The Florida folks-Trey Beasley, George Handel, and Elaine Chandler, all experienced boaters-were eager to haul a bunch aboard. But the impact of the 1958 earthquake, rock-and-ice fall, and surging water couldn&apos;t be missed from our high point on the small island. The slopes that had been wiped clean of trees were now green with new growth, the young forest much lighter in color than the upland vegetation that had remained unharmed in the catastrophe. Looking over the calm water, I couldn&apos;t imagine a wave more than 100 feet high and moving at more than 100 miles an hour. Nor could I imagine anyone surviving being run over by it. Reports say trees were uprooted, bark stripped away. Some came to rest on the shore of Cenotaph, lined up side by side with their roots pointing back into the bay. They lie there today, propped up by roots on one end and branches on the other. The tree trunks, likely spruce, are weathered and gray but seem strong and solid they rise above the muddy shore. After dinner, Bob Anderson came back from a private exploration of Cenotaph to report he had found the memorial site we missed earlier. Joyce and I joined him in the skiff and hurried back to the island. Bob had been a land surveyor for many years. Heeding his professional instincts, he fought his way through the brush to a rocky knob overlooking the bay, only a few yards from where our unsuccessful search ended earlier, and found the site. Someone had cut or broken stainless-steel bolts holding a bronze memorial plaque to a pad of concrete laid across a large boulder and stolen the plaque. Scrambling down the slope to search further, Bob found a large plastic pop bottle that contained a copy of the original French listing of the names of the lost seamen, handwritten on notepaper and sealed in a plastic bag. Joyce drained accumulated water from the bottle and we looked briefly at the document. She reinserted it carefully and twisted the cap tightly. Bob laid it on the concrete pad. With Ursa-our oasis, still in sight, Trey, my wife, Polly, and I marched across the glacial moraine, not pretending to be the John Muir. In places we dropped down into the dry washes left by streams draining out of the glacier long ago and then struggled up and out through a maze of loose stones. In some places, as the ice beneath the rocky surface slowly melts, the rock collapses into a depression that looks like a bomb crater. Finally, we were able to pat the muddy glacier on its flank. 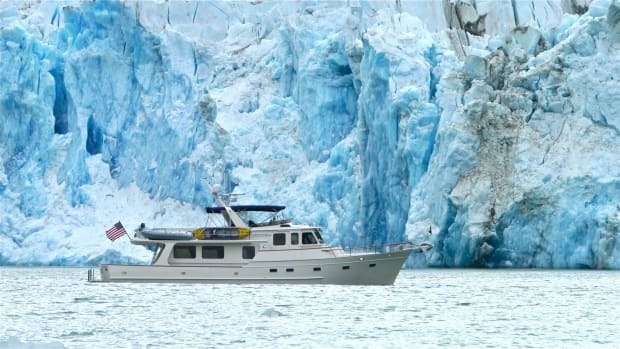 It probably was about a half-mile wide and was discharging ice into the bay only at the glacier&apos; extreme ends. Water gushing with the force of a fire hydrant spouted from a crack deep in the glacier. Keeping the yacht lined up with the range markers put those ocean swells on the beam. The North Sea-style yacht has a round bottom and she loves to roll. And roll she did, as swells of 6 to 8 feet punched her in the side. All that fuss exiting Lituya Bay was caused only by ocean swells. The current was slack and not colliding with the swells. There were no topping seas or combers; the swells were enough. Once we were several miles off shore, Bob turned south and put the swells, now four-footers, mostly astern, and cleanup began. By the time we turned into Cross Sound, the swells had disappeared and Ursa motored serenely through a light chop and whitecaps.